Philippine President Rodrigo Duterte yesterday said he would ask the leaders of Indonesia and Malaysia to “blast” pirates out of regional waters and would refocus security efforts to solve the problem. Hive (Highly Interconnected and Vibrant E-trade), a freight forwarder platform powered by Global eTrade Services (GeTS) is set to facilitate connectivity between freight forwarders, their business partners and customs agencies. 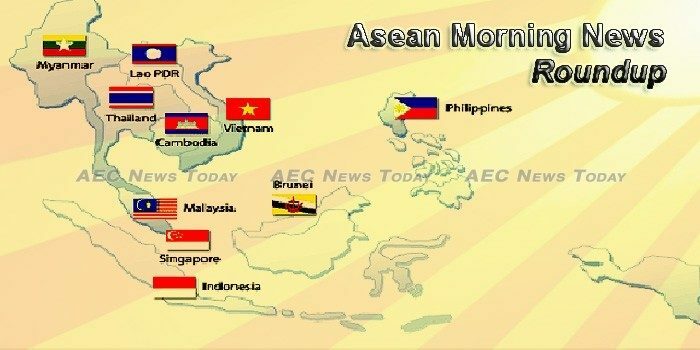 The Association of Southeast Asian Nations (ASEAN) needs to further push intra-regional trade and investment to fully benefit its citizens from economic integration, said the country’s top diplomat. The 50-year-old Association of Southeast Asian Nations (Asean) is seen entering the “middle age” crisis especially in the face of new challenges such as growing doubts on globalization and fast-changing socioeconomic landscapes, raising questions on whether the so-called “Asean way” or the slow process of decision-making would still work in the years ahead. Immigration officers and agents at ports of entry nationwide have been placed on heightened alert in light of the Association of Southeast Asian Nations (ASEAN) leaders’ summit in November and other preparatory meetings currently being held in various areas in the country. Among six major countries in the Association of Southeast Asian Nations (ASEAN), Singapore and Malaysia are the best starting conduits for entering the Southeast Asian market; Indonesia and the Philippines are the two markets with the greatest development potentials, while Indonesia and the Vietnam suffer higher risk of currency volatility, according to Ma Tieying, vice president for economic and foreign exchange research at the Singapore-headquartered DBS Bank. The government of Indonesia has been consistently receiving the highest total score of democracy index, as compared to other ASEAN countries, according to Universal Periodic Review 2017 held by the United Nations Human Rights Council. Chinese Premier Li Keqiang and Russian Prime Minister Dmitry Medvedev are coming to Manila to attend the Association of Southeast Asian Nations (ASEAN) Summit and Related Meetings next month. The Philippines is working with fellow Association of Southeast Asian Nations (Asean) members on initiatives that will help communities recover faster from the impact of natural disasters and climate change, the Finance department said. United Nations Secretary-General Antonio Guterres will join several world leaders that include US President Donald Trump for the annual Association of Southeast Asian Nations summit to be held in Manila in November, Foreign Affairs Secretary Alan Peter Cayetano said Thursday. President Rodrigo Duterte on Thursday assured the Association of Southeast Asian Nations (Asean) of the Philippines’ commitment in maintaining peace and security in the region. One of Cambodia’s largest conglomerates is reviving plans for the Kingdom’s first communications satellite, with hopes of launching by 2021 with assistance from China. Sweden said on Thursday it would rethink its engagement with Cambodia if the main opposition party is dissolved, in the strongest warning yet from a Western aid donor. South Korea’s Daegu Bank has snapped up a 100 percent stake in Cam Capital, the Kingdom’s second-largest specialised bank in terms of assets, for $63.2 million, Korean media reported yesterday. Tomorrow marks Indonesian President Joko Widodo’s fourth year in office, but the popular leader – who succeeded in pushing for infrastructure development, and reforms in healthcare and education, as well as fighting corruption – refused to be drawn into re-election talk just yet. The government has set an excise tax on average of 10.04 percent for tobacco or cigarette in the 2018 State Budget Draft. The rupiah dropped to its weakest since December earlier this month, but since then has been trading within a narrow range of 13,455-13,517 per dollar. The government will control the spending ceiling and reduce the budget deficit next year to prevent Laos from being dragged into an economic crunch. Some 118 unapproved state investment projects were uncovered following an inspection of the audit of the 2013-2014 fiscal year budget, the state top inspector told the National Assembly (NA) this week. Laos should improve the tourism service sector to attract more visitors and earn greater revenue to contribute to socio-economic development according to National Assembly (NA) members during debates Thursday. Approved investments in services, manufacturing and primary sectors for first 6 months, drop 28.2% from 91.2b rgt in same period last year, Malaysian Investment Development Authority says in emailed statement. Prime Minister Datuk Seri Najib Razak today unveiled the nation’s ‘to-do list’ which will further boost Malaysia’s digital initiatives implementation as well as its economy. The Malaysian Institute of Economic Research (MIER) has revised upwards its gross domestic product (GDP) growth outlook for Malaysia to 5.4% this year, driven primarily by stronger domestic and external demand. The government has requested for a loan of more than K1 trillion from the Central Bank of Myanmar (CBM) to fund the budget deficit for the 2017-18 fiscal year. The request was submitted to the Pyidaungsu Hluttaw on October 17. UNICEF says the children who make up most of the nearly 600,000 Rohingya Muslims who have fled violence in Myanmar are seeing a “hell on earth” in overcrowded, muddy and squalid refugee camps in neighboring Bangladesh. Myanmar’s security forces stand accused of crimes against humanity, with the latest report from rights group Amnesty International documenting breaches of at least six items of the 11 detailed in the Rome Statute. President Rodrigo Roa Duterte on Thursday, October 19, expressed zero tolerance for corrupt public officials and tax-evading businessmen who are shortchanging the Filipino public. As a subtle approach to the war against illegal hard drugs, President Rodrigo Duterte proposed the use of a portion of the Fort Ramon Magsaysay military installation to construct the Mega Drug Abuse Treatment and Rehabilitation Center (Mega DATRC). In partnership with Muntinlupa City Government, Edukasyon.ph will hold the first and largest international education fair in Southern Metro Manila at Festival Mall Alabang on October 21-22 wherein 18 foreign schools and 5 embassies will be offering study abroad scholarships​ ​to​ ​Filipino​ ​students​ ​and​ ​professionals. THE unique challenges presented by the global ageing trend across several large countries have thrown up a debate over whether slower labour force gains would weigh on economic growth enough to lower interest rates, a fresh report from JPMorgan Asset Management showed. Singapore is the most robust country for data centres in Asia as it scored 84.50 out of 100 in Cushman & Wakefield’s Data Center Risk Index. Prime Minister Lee Hsien Loong said on Thursday (Oct 19) that he is not sure if the dispute with his siblings over plans to demolish the home of Lee Kuan Yew has been solved. Prime Minister Prayut Chan-o-cha abruptly cancelled a press interview session at Government House Thursday, leaving the media confounded as to why the regime said it would host CEO Mark Zuckerberg in Bangkok on Oct 30. Exports rose for a seventh straight month in September, surging 12.2% year-on-year to a record-high US$21.8 billion (722.4 trillion baht), as demand increased in all traditional and emerging markets, says Commerce Minister Apiradi Tantraporn. Business process outsourcing, solar and wind energy, luxury hotels, modern agribusiness and food, and retail banking are five sectors with tremendous room for growth in Vietnam, PricewaterhouseCoopers, multinational professional services network, stated in its latest report. Uber officially launched the largest partner support center in Vietnam, called Greenlight Hub, in Hanoi on October 19. General Secretary of the Communist Party of Vietnam (CPV) Nguyen Phu Trong has urged Ho Chi Minh City to be proactive in gaining support and assistance from other sectors for its stronger growth.